Deep beneath the waves, all should be calm and quiet – but in Sepron’s kingdom, terrible danger lurks. Tom must break the vicious sea serpent’s grip on the ocean depths. But Sepron is a cunning and slippery enemy. Will Tom ever see the world above again? Great opening to the rest of the story! 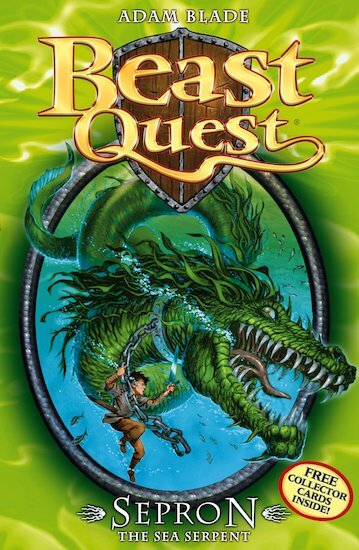 I read this book when i was about 8 and it was the only beast quest book that i read. But i can only remember some of it i still remember that it was great! I thought it was a great book and it was a great twist that he had to hold his breath under water. The book has a great story line to it also it is a scary and a great monster. Tom sets of on his second Quest Tom meets a boy named Callum Helps Tom and Elenna got to get the Chain of Sepron the Sea Serpent.